Ragù in Italy is a general term used to indicate a meat sauce cooked over low heat and composed of many ingredients, which may vary according to each region — “à la Bolognese” is only one of the many ways this sauce is prepared. 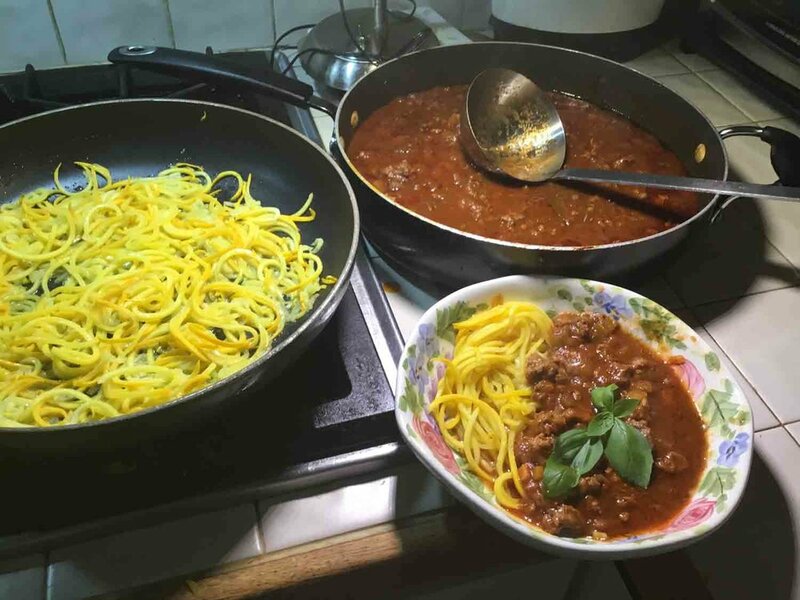 When we were in Italy this summer we had a cooking class in Montepulciano and the owner of the villa, Laura Dochini, was kind enough to send this simple recipe: “Ragù Bolognese: 2/3 beef, 1/3 pork, onion, carrots, celery, salt and a lot of olive oil. Cook all of the ingredients for about 1h30m very slowly and turn sometime, give attention to don't stick (don't add water, but only try to put a flame arrestor between the flame and the pot). When the meat is well done, add a glass of red wine, after 10 minutes add the tomatoes and a little bit of tomatoes paste. Cook for another half an hour.” What wasn’t included in the recipe was: Go out and kill the boar, which is what her husband had done to get the meat used in the sauce we had! This is a delicious Keto Bolognese sauce that is thick enough to eat in a bowl as a stew, or can be served over any spiralized or thinly sliced vegetable. Enjoy! Normally we use a higher percentage of fat for Keto, but the leaner meat will shrink less and you add fat by using oil, ghee, bacon fat or butter to fry the vegetables. Of course, you can ask your husband to go out and kill a boar. As alternatives, you can mix beef and pork or use all pork — but adjust the macros (pork has a better Keto profile with higher fat, lower protein). If you don’t have that available, you can find another no-sugar or low-sugar brand or make your own, but then figure your own macros if you are tracking. The Hunt’s sauce used here, in total, has 2.5 fat, 35 carbs and 5 protein. 1 cup beef stock (reconstituted bouillon or liquid stock). You can also use beef bone broth if you have it but you will have to adjust your macros because bone broth will have protein that the stock or bouillon does not have. The macros in this recipe are based on Swanson’s Beef broth: 0 fat, 1 carb, 2 protein. Just be aware there are variations even between broths, stocks and bouillon powder or cubes. Count accordingly (if you track). As this recipe calls for all beef, using bacon fat lends a nice flavor to the ragù. There is very little variation in fat grams between types of fat. This recipe is based on 3 TBS of avocado oil, which is 42 grams of fat. If you use carrots in your Keto household, you can add 1/4 cup (29 g) of those as well, but adjust the carb macro. Brown the meat in a large skillet. If you are not using non-stick, give a spray of olive or avocado oil. The meat is lean so it might stick. If you are using pork with a higher fat content you may not need to spray a pan even if it is not non-stick. Remove meat and juices to a plate and add the fat to the skillet. Once it is heated add the diced vegetables and cook over medium heat until softened, stirring frequently (about 10 minutes). Push the vegetables aside. The pan should already be well-coated with fat (if not, add a tsp of fat). Add the minced garlic, stirring for about a minute until fragrant. Mix the garlic with the vegetables, then add the dried ingredients (Italian seasoning, salt, bay leaves) and stir for about 1 minute. Add the meat back in, and stir in the tomato sauce and broth. At this time, you may add about 3/4 cup of red wine. The alcohol and sugar burn off leaving only the flavor; there is, however, some controversy on how to calculate the macros for this. Therefore, I have left it out of the recipe, but if you can figure it all out to your satisfaction, be my guest! Bring to a boil but then immediately reduce heat and simmer covered for 30 minutes and then remove cover and simmer another 20 minutes. You will note in Laura’s recipe that she says “try to put a flame arrestor between the flame and the pot.” You have seen these — they are discs that distribute the heat more evenly through the pan. If you don’t have one just watch the skillet so that the sauce never comes to a boil once you have it on simmer and also stir occasionally so that the meat does not stick to the pan. Another thing about the cooking process: Cooking without the cover reduces the liquid. My husband prefers it very saucy so I personally keep the cover on throughout the entire cooking process.